Massage Therapists can help you with extensive soft tissue damage, injury, chronic disease, pain management, impaired mobility and for common treatments to help stress relief and maintain well-being. 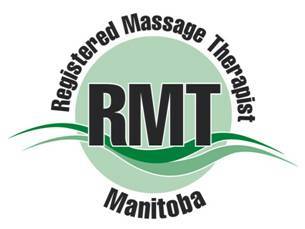 In Manitoba, massage therapy will be regulated under the Regulated Health Professions Act (anticipated by 2021) and the professional titles Registered Massage Therapist and Massage Therapist will be protected: giving assurance that the professional you see has graduated from an approved school, maintains their professional competency, and follows the standards of practice as set out by the regulator. This MTAM-exclusive insignia is your assurance you are seeing a massage therapist that has acheived the minimum nationally-accepted qualifications and standards of the profession. Do not compromise your health care to just anyone and ensure you ask about the education your practitioner has received. The RMT will request you to complete a health history form and review it with you prior to any treatments. The RMT will request copies of any prescriptions you have from a medical doctor as this becomes a specific guide for the assessment of treatment. The RMT will review methods of payment with you (benefit plan/cash/cheque/credit card etc.). The RMT will ask you to identify areas of pain and discomfort using your own description followed by basic testing of things like range of motion and sensitivity, etc. The RMT will ask you to sign consent forms that provide the therapist with your authorization to begin treatment. Do not sign for any treatment you do not want or do not understand. The RMT will then take you to a treatment area and give you instructions regarding disrobing and preparation for the treatment. The RMT will then leave the room and allow you to prepare yourself. Disrobing: if you are uneasy about the amount of disrobing required, please discuss this with the RMT. You do not have to disrobe completely. The RMT will advise you based on the treatments following assessment. Normally you will begin, once disrobed, lying face down on the table under a drape prepared for you by the RMT. The RMT will alert you that the treatment session is to begin and then re-enter the room. The RMT will then communicate with you about the type of treatment to begin your massage session and will utilize professional draping practices to only expose the part of the body that is being treated. This will be the case throughout the entire treatment. Average treatment is one hour. Communicate with your RMT during the treatment. Ask questions and identify areas of sensitivity. Guide the RMT to areas where you are experiencing specific physical discomfort. If there is any discomfort that is not tolerable, let your RMT know immediately and they will adjust pressure or utilize another treatment procedure. Communication between client/patient and the RMT is most important throughout the session. The RMT may use several different massage techniques during the treatment and will use massage oil to assists the process. If you have allergies to certain oils do let your Massage Therapist know in advance and they will also adjust their treatments or select oils that do not cause you irritation. Again please communicate. Upon completion of the treatment, the RMT will return you to a fully covered position under a drape and allow you some time to recover from the massage. Some clients/patients feel a little light headed following a treatment and this is normal. Just wait for your body to recover before you get off the table. Relax and let the benefits of the massage bring you back to normal equilibrium. When you feel that you have recovered, you can then redress and return to the reception area to meet again with the RMT. If you do feel any discomfort wait for the RMT to return and assist you in the recovery process. The RMT will discuss future treatment requirements.